Considering a live oak (Quercus virginiana) grows into a magnificent shade tree that is wind-, salt- and drought-tolerant, trimming it when young ensures good branch structure. Since it matures 40 to 80 feet tall and 60 to 100 feet wide after many decades, siting properly in a spacious landscape diminishes any need for constant pruning or branch-tip trimming. Never over-prune to destroy the natural shape, structure or beauty of the live oak; focus on encouraging an open, healthy canopy for light and air to penetrate. Scan the canopy of the live oak, noting any dead or broken branches that warrant immediate removal. Clip off twigs that are less than 1/2 inch in diameter with a hand pruners, while those larger are best with a hand-held pruning saw. Use an extension pole for higher branches. Look for potential disease or rot problems around the branches removed in Step 1. Any soft, rotted bark or dead bark that is flaking off a branch may reveal a larger issue. Trim off the diseased section of the branch, making the pruning cut in the healthy tissue 1/4 to 1/2 inch above a lower branch junction or trunk. Evaluate the canopy of the oak once again after dead or broken branches are gone. Now look for branches that are rubbing together or are destined to grow into nearby branches within three to five years. To remove the problematic branch tip, make a pruning cut 1/4 inch above a junction with a lower branch. Step back and evaluate the removal to see if you removed an appropriate length of branch. Prune off any vertical twigs that are growing upward through other layers of canopy. Live oak's branches naturally sprawl upward at an angle; vertical, fast-growing sprouts on horizontal branches lead to uneven weight distribution later. Don't remove the tree's one top growing tip, though. Trim off any branch tips that look overly scrawny or floppy, perhaps errant when compared with others. For example, the oak tree's canopy may look rounded, but one thin branch sticks out 4 feet. If you allow this branch to grow over the next few years, it will continue to create a lopsided shape overall. Consider trimming this branch back to make it more in line with the rest of the tree. Do not paint or seal pruning wounds. Allow the tree to naturally callous the wounds and heal itself. 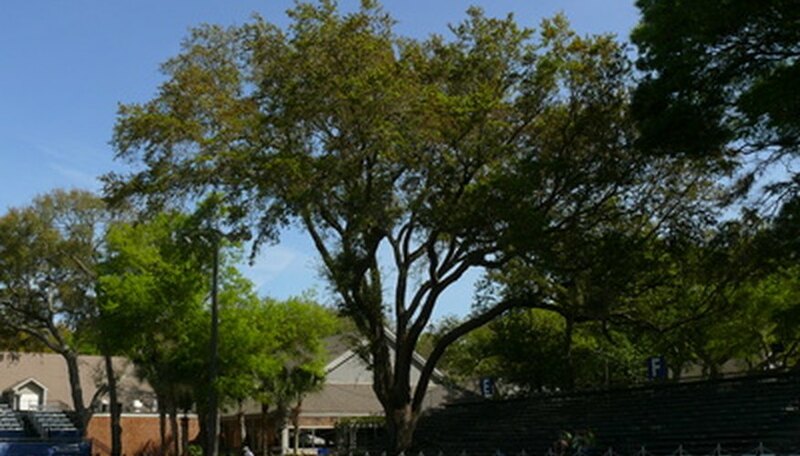 Generally speaking, live oak rarely need trimming since they naturally attain a good branching structure. Trees larger than 10 feet tall make difficult trimming projects. Consider hiring a professional arborist with appropriate equipment and training to address the pruning on the live oak. American Forests recommends that every five years, an arborist should visit to assess the live oak tree's growth progress. Never trim tree branches that are close to power lines. Contact a professional to address the concern. Rinse the pruner blades or saw blade with rubbing alcohol after you cut away branches that are diseased. This kills any pathogen and prevents you inadvertently spreading the disease via the utensils as you travel across the tree making pruning cuts. If oak wilt disease is prevalent in your region, do not prune from mid-spring to early summer. Focus on late summer or late winter for the task.